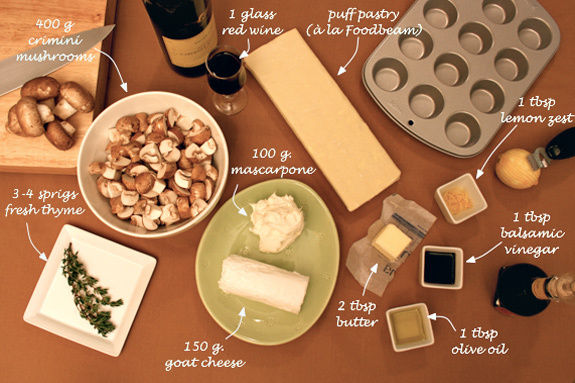 Posted in appetizers, French, recipe, savory by Antonio Tahhan on May 20th, 2008. You can follow any responses to this entry through the RSS 2.0 feed. You can leave a response, or trackback from your own site. Tony, you make the arduous seem so simple…I love the pics and the diagrams. Congrats on your impending grad and I hope we see more regular posts from you. Tony, these appetizers look delicious! Wine braised mushrooms, mascarpone and goat cheese are a great combo. And *thank you* for linking to Foodbeam’s directions on puff pastry — I’ve long wondered about making it myself, since I don’t buy the junk in the supermarket with all that nasty artificial stuff in it. Definitely going to try making my own now. Those look beautiful, I craving a half dozen of these right now. I can taste the wine braise right now! 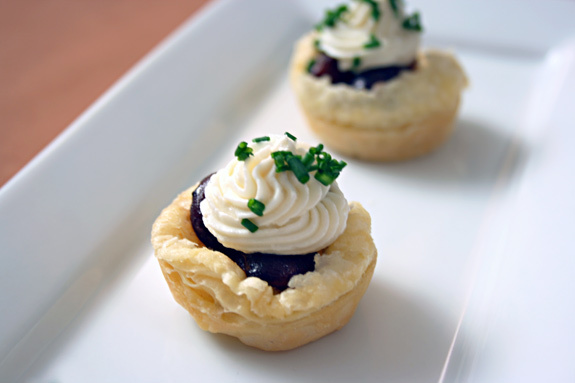 These wine braised mushroom cups sound so good! Those are gorgeous! I’ll take one, please. Ok, three. Fine! Four. Those are gorgeous! I’ll take one, please. Maybe three. Fine! Four, but not one more. Tony, I just found your site through Meta’s blog and am very impressed! Gorgeous, fun photos, and the recipe sounds great. Thanks, man! Yes, have made puff pastry from scratch, but would buy the frozen stuff if that was what it took to be able to have the time to make these gorgeous mushroom cups. Who needs a heavy meal when you have these, wine and some biscotti? Those look incredible! The recipe sounds so flavorful and I love how mushrooms seem to soak up the sauce. I’ve never made puff pastry before, nor have I ever made anything with it… But it’s one of those skills I need to learn. The way you put your pictures together is great! Peter – Thanks!! Hopefully once I pack everything and move in to my new place I’ll get back in the grove of things. Kevin – I must say, they were a hit with my friends! Elle – haha, you may have as many as you’d like! I’m really glad you enjoyed them. Amy – The ingredients went really well together. Fanny’s post is great and a valuable resource I knew I had to pass along. WORC – Thanks!! I loved the flavor that came through the wine-braising. Elle – I may have exaggerated the cons of buying frozen puff pastry just a bit, haha. 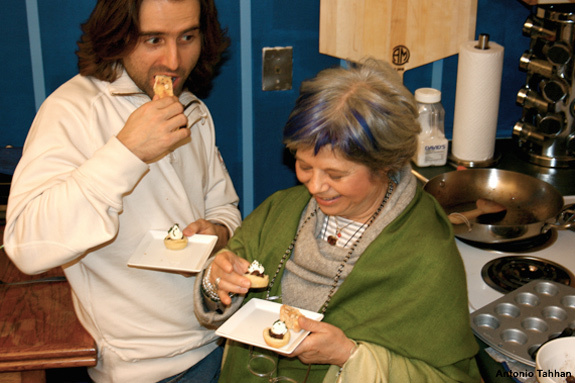 I am a huge fan of just having only a few tasty things on the menu and enjoying the party and food with my guests. Christina – Thanks!! haha, the mushrooms soak up EVERYTHING and pack great flavors. 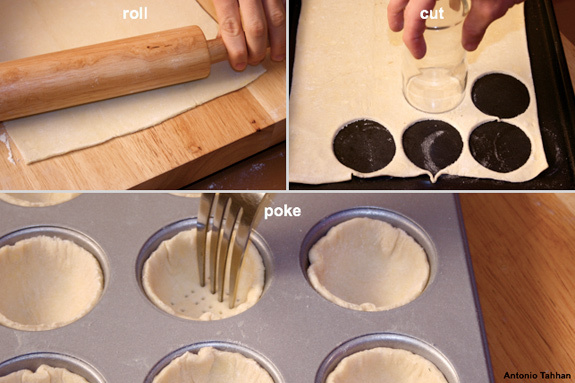 Puff pastry is definitely a treat to make at home. Fanny’s guide will guide you through each step and you’ll pretty much be a puff pastry expert in no time. OK, Antonio…. You just made a, ah-hem, “29” yr old married mother of 2 blush with embarrassment – just this week I bought a puff pastry from the freezer section of my local grocery. I will NEVER do that again! These look amazing! You have a great site full of terrific, fun recipes. I look forward to browsing through them all & trying them out. Congratulations on graduating. I’m sure your parents & professors are extremely proud of your achievement. these look amazing ~ very meticulous and looks delicious. Congratulations on graduating as well!!! I just linked to your blog and I’m wicked impressed! It’s so great to see a young guy who loves food, cooking and culture. Man, when I was in college, even though I loved cooking even then, the only thing I could really afford to make was stir fry! I also remember eating lots of popcorn. This is a great blog! Wow. I love the way you present a recipe and your pictures are stunning! Very inspiring. Amazing blog. I have tagged you, hope you don’t mind, and if you have no time to do it, it’s fine… Have fun, and good luck! Mushroom cups look soooo yummy! i love, love, love… send me one or 20! !